Notis Sfakianakis was born in Iraklion, Crete. From 1976 until 1984 he worked as a DJ at local clubs and disco's. In 1985 he opened up his own place that played live music, there Notis sang for the first time professionally and he also plays the drums. A little while later, in August'85 he was offered to work at a local night club and his professional career as a singer began. Notis Sfankianakis and his family moved to the island of Kos when he was seven. Notis became a disk jockey in his early 20s. He supported himself by working as an electrician, plumber, waiter, and laborer. In 1985 he formed a band and played in clubs in Kos. Due to the lack of success, the band broke apart after less than year of being formed. In 1986 Notis moved back to Crete to start his solo singing career. Notis began opening for national acts like Poly Panou. He was discovered by Costas Bourmas, the general manager of Sony in Greece. Bourmas signed Sfakianakis to the label, and Notis recorded his debut album First Time which made it into the Greek top ten. He is one of the most successful singers of his era in Greece. Notis is on top of his game more than ever before. He knows how to change his music style to make his listeners want more. In his new live cd Magical Nights he once again displays his magical voice and again proves why he is one of the greatest performing talents in Greece. Of his early works, his most notable release was Opa Opa which was written by Giorgos Alkaios and later covered by Despina Vandi and Antique. In 1994 he released the album Notioanatolika Tou Kosmou (Southeast of the World), which included O Aetos (The Eagle). It is widely agreed that this album was the catalyst for his achievement of superstardom in the greek-speaking world. He followed this with high profile tracks such as Den Se Hreiazome (I Don't Need You), Soma Mou (My Body), Gyftissa Mera (Gypsy Day), Na Hareis (Cherish) and Oi Skies (Shadows). Sfakianakis released his own version in 2004, with Mpikakis contributing an introduction on his lyra. It appeared on the album Me Agapi O,ti Kaneis (With Love Whatever You Do), and later appeared on the album Koinonia Ora (Community Hour). There has since been much debate as to which version is better: the case for Mpikakis is that he performs the song with more passion, that as the creator of the song, it is much more hard-hitting for him. However, many argue that it does not compare to the grimmer, grittier 2004 version, and that Mpikakis' voice is no match for Sfakianakis. 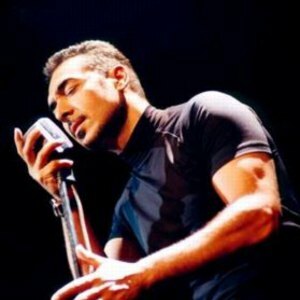 In November 2007 Sfakianakis released a new album, Mnimes (Memories). Amongst the songs currently predicted to become hits are Klemmena (Stolen) and Par' Ta (Take Them).